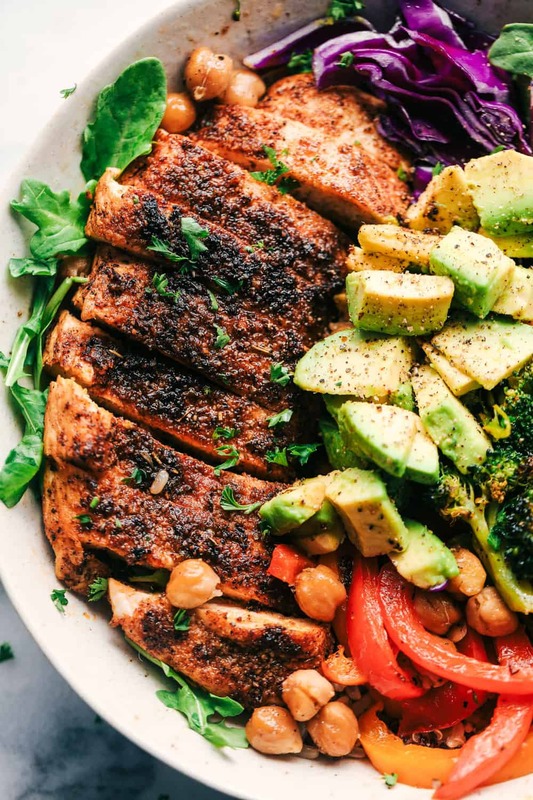 Blackened Chicken Avocado Power Bowls have the best spiced rubbed blackenend chicken with so many power foods! Avocado, chickpeas, red cabbage, quinoa and roasted veggies come together in this healthy and flavorful bowl! Have you had a power bowl before? They are one of my favorite things to eat and they keep me on track all year long. Wellness never tasted so good and you don’t have to sacrifice on flavor to bring yourself a healthy and delicious meal. These bowls are jam-packed with so many good for you nutrients that keep you full and going all day long. Let us talk about the star of these bowls. The blackened chicken. I am always making this blackened chicken. The chicken gets blackened with McCormick’s quality spices. It creates the most incredible spice rub and leaves a black spiced pan seared crust on the chicken. It is bursting with so much flavor in each and every bite! 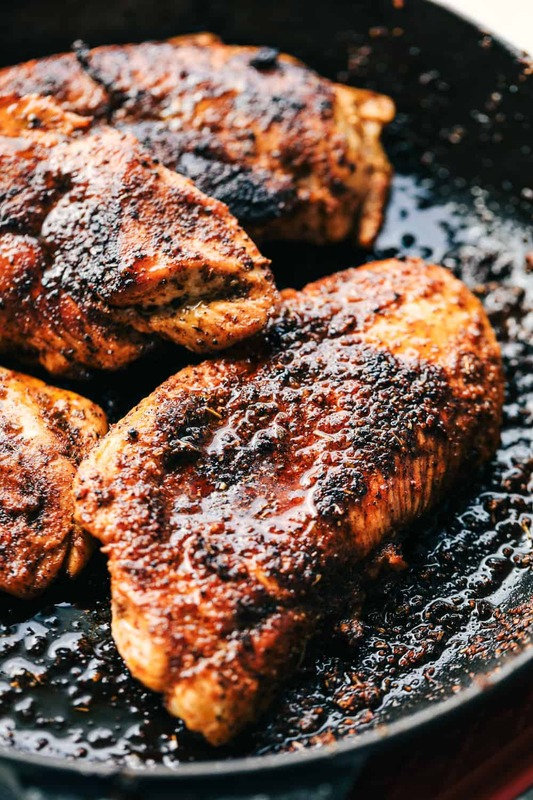 How do you make blackened chicken? 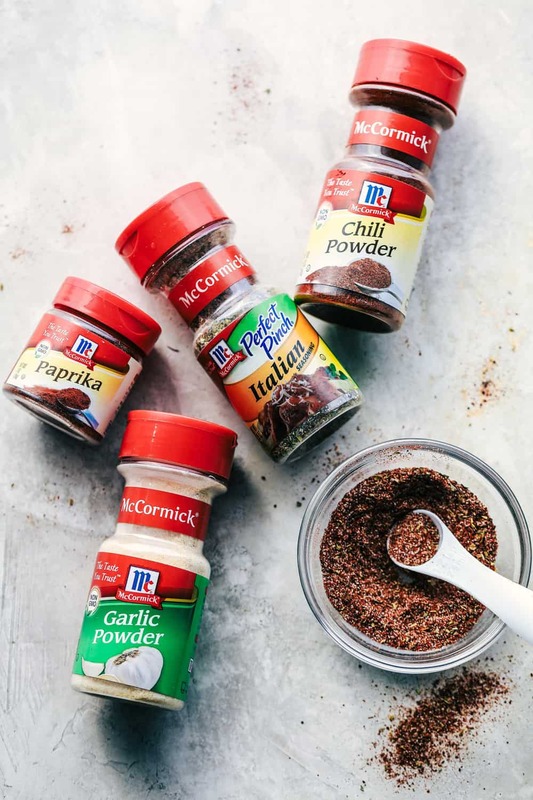 Chili powder, paprika, onion powder, garlic powder, italian seasoning, salt and pepper all come together in this perfect spice rub. Oil each side of the chicken breasts and rub with the spice rub. Add a tablespoon of olive oil to a medium sized skillet and cook the chicken breasts on medium high heat and cook on each side until cooked throughout. Blackening is a cooking technique and while it may appear burnt, the dark colored and deeply flavored crust is a result of the charred spices. The thing that I LOVE about power bowls is that they are also perfect for meal prep. It is easy to roast a pan of fresh veggies and chick peas. There are so many healthy foods that are included in this meal. Avocado, broccoli, peppers, broccoli, chick peas, and red cabbage come together to create this power bowl. Low carb and keto friendly this a fresh and delicious meal that you will crave all of the time. It has so many health benefits and it is packed with protein and fresh vegetables. 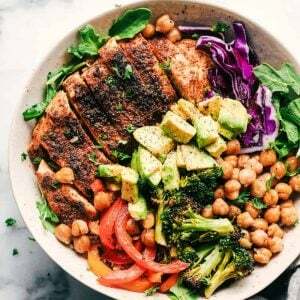 These power bowls are perfect for a healthy lifestyle, and this blackened chicken recipe will be used all of the time. I know that you are going to love these delicious and healthy bowls just as much as I do! 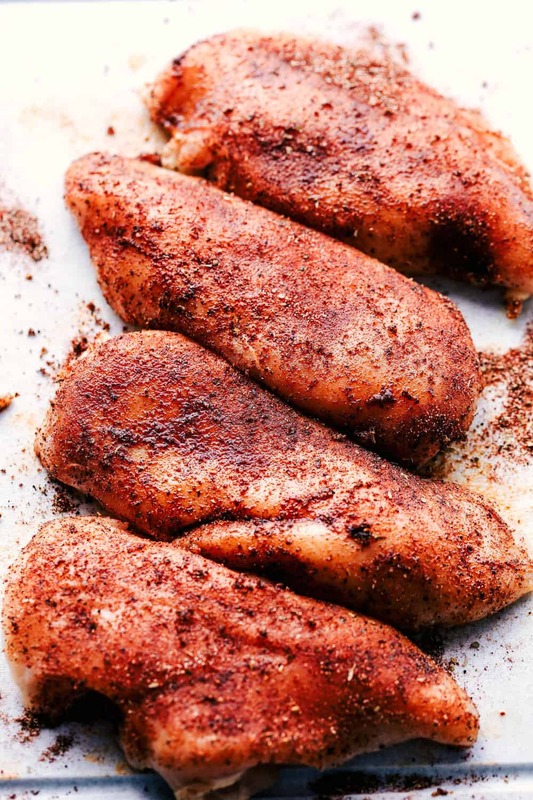 To prepare the chicken: In a small bowl add the chili powder, paprika, onion powder, cumin, garlic powder, Italian seasoning, and salt and pepper. Use about 1 tablespoon of the oil the chicken. Rub the spice rub evenly on the front and back of the chicken. In a medium-sized skillet over medium-high heat add 1 tablespoon of the oil. Add the chicken and cook on each side about 2-3 minutes or until cooked through. To roast the veggies: Preheat oven to 425 degrees. On a baking sheet add the broccoli, pepper, and chickpeas. Salt and pepper and drizzle with remaining olive oil. Roast for 15 minutes or until tender. 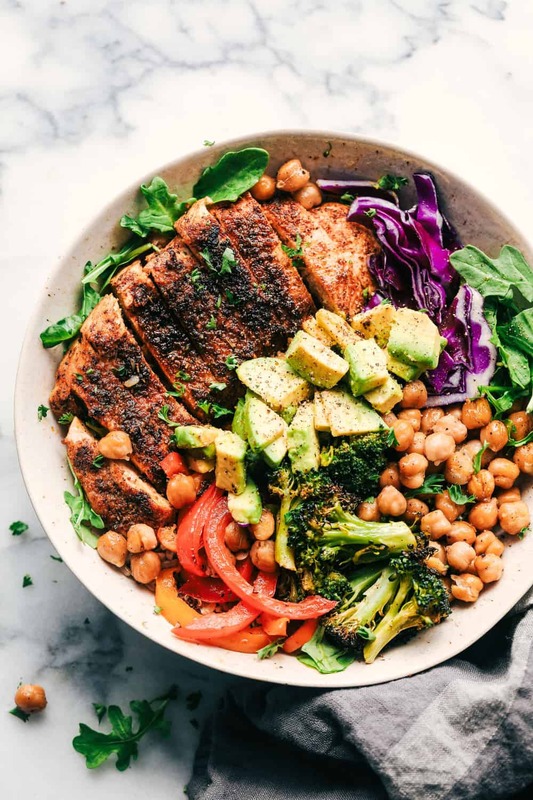 To assemble the power bowls: Divide the chicken evenly with the broccoli, peppers, chickpeas, avocado, and red cabbage. hey girl- these bowls look so yummy! What’s the serving size and calorie amount serving?